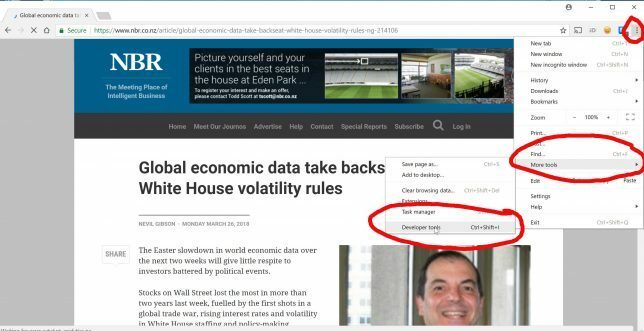 Do you want to print off articles (either on paper or PDF) from unprintable websites like the NBR? Some web property owners set up their sites so that you can only view them on screen. No problem, it’s completely possible to print these off using this little trick. You’ll need the Chrome browser to do this. First, navigate to the page you want to print. Now, find the “hamburger” (three vertical dots) at the upper right hand side of the screen, click it, then click on “more tools”, and then on “developer tools”. Now find the second hamburger just below the first hamburger, and click on that. Now click on “More tools” and “Rendering”. Now you’ll need to look for the block at the bottom right hand corner and scroll down to the bottom. You’ll see a block which says “Emulate CSS Media”, with a little dropdown box below it. Click on that dropdown box, and click on “screen”. Yay! You’ve now overridden the browser’s restrictive print handling. Now you can print as normal. Find your way back up to the top hamburger, click it, and then click on “Print”. And go through your normal printing procedure. Enjoy consuming the media you’ve paid for either by subscription or advertising revenue eyeballs.